These womens Miaow heeled ankle boots are a gorgeous addition to any womens' outfit. The bold and unique appearance of the Bordeaux shiny textile upper is complimented with with radiating lines of stitching over the boots rounded toe and green embroidery detail embellished with sequins. 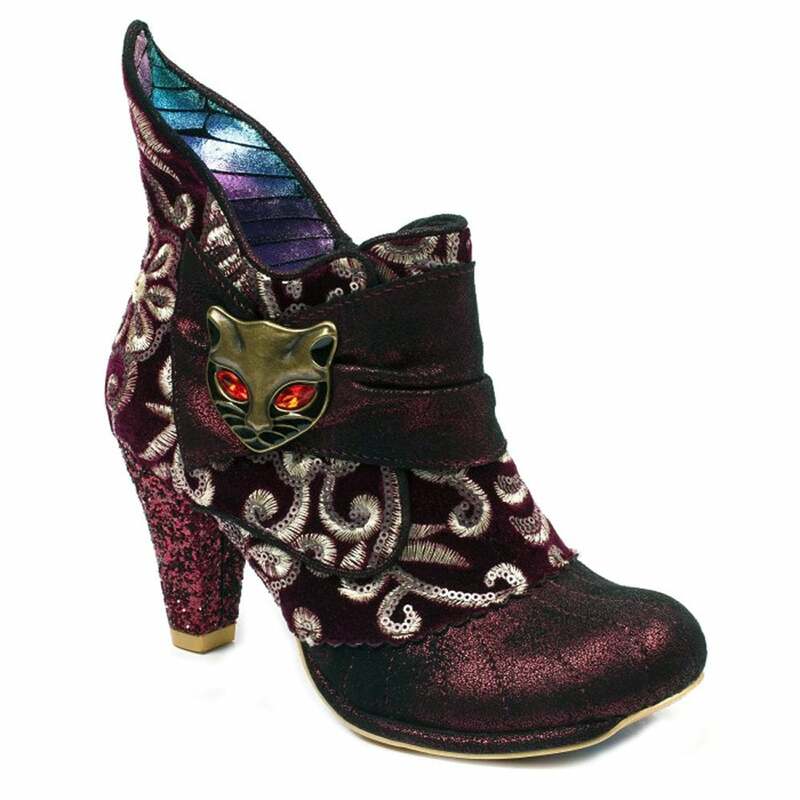 Travelling over the front of this stunning womens ankle boot is a soft, broad strap secured in place by a tarnished bronze coloured metal cat face detailed with stunning amber coloured faux gem stone eyes and black enamel. Fastening the Irregular Choice boot is a side zip travelling from instep to undulating topline while inside, the Miaow womens ankle boot is lined in a beautiful irridescent fabric with the Irregular Choice branding embroidered in gold. A shapely 8cm (3.25 inch) high heel covered in Bordeaux glitter completes this fabulous boot perfectly. Even the soles have not been forgotten with their pretty floral print of lillies and flying beetles! Please note that the cut of the embroidered pattern may vary from shoe to shoe and that shown on the photograph. Eye gem colour may also vary.